NEW YORK, NY / ACCESSWIRE / September 17, 2018 / On Sep 14th, the world-leading AI based exchange Bibox listed Gemini Dollar(GUSD) and it's the very first exchange to officially list Gemini and launch GUSD market. 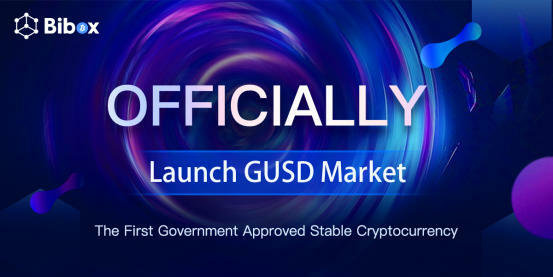 The deposit and withdrawal of GUSD and GUSD market was open at 15:00 on 09/14/2018 (GMT+8). Gemini Dollar(GUSD) is a cryptocurrency built on the Ethereum network, approved by the NY Department of Financial Services (NYDFS). In the field of cryptocurrency, the importance of stablecoins is self-evident. It's the "holy grail of cryptocurrencies" during the market fluctuations. Due to the diversity of global cryptocurrency regulations, the exchange must have its own stable currency trading pair for the long-term development. But stablecoins still face some challenges, many exchanges are searching new ways to solve the gap between fiat currency and crypto currency. On Sep 10th, the Winklevoss-twins backed crypto exchange Gemini, announced that it has launched a US dollar backed stable coin hosted on the Ethereum network. Gemini users will be able to convert U.S. dollars in their Gemini account to Gemini dollars and withdraw them to an Ethereum address. Gemini Dollar(GUSD) is strictly pegged 1:1 to the U.S. dollar. The New York Department of Financial Services (NYDFS) will directly supervise the operations of Gemini dollar and be the regulatory authority of the projects. Back to Oct 2015, GUSD has got the approval of NYDFS that it can offer Bitcoin exchange services for US clients. With the launching of first-ever regulated stablecoin, GUSD has totally got its advantage on the regulations from the very beginning. On Sep 11th, the Winklevoss-twins announced that Bibox will be the official exchange to list GUSD. Bibox is the world's top ten encrypted digital asset exchange which established in 2017. Featuring high security and smooth operations, Bibox has got a lot favor from investors. Bibox always holds a global mindset in its operations and pioneer its business in many ways. It's the first exchange to apply AI technology in cryptocurrency field, which made tremendous breakthrough in project selection, security and user experience. Bibox also joined forces with Huobi, establishing a new exchange pattern which also being the first in the digital assets industry. In mid-August, Bibox obtained the Swiss VQF license and established a blockchain laboratory- BiboxLab. Now Bibox has expanded its business to more than ten countries including the United States, Canada, Singapore, South Korea, Switzerland, and Estonia, and its trading volume keep ranking among the top ten in the world. We will stay tuned for something big that is bound to happen on Bibox.